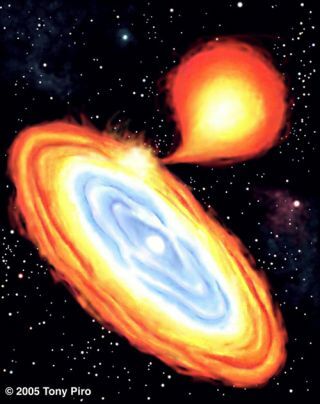 Artist's impression of an AM-CVn star system, where helium flows from one star to the other, piling up as a shell that may end up exploding as a .Ia supernova. A new type of supernova ? the explosive death of a star ?has been discovered in which helium detonates on the surface of a white dwarfstar. The explodingstar, dubbed SN2002bj, was first observed seven years ago in the galaxy NGC1821 by amateur astronomers, but was misclassified as a Type II supernova. There are two general types ofsupernovas: In a Type I, a star accumulates matter from a nearby neighboruntil a runaway nuclear reaction ignites. In a Type II, a star runs out ofnuclear fuel and collapses under its own gravity. But SN2002bj had a different signature than any of thevariations known in these two types. In particular, it brightened and dimmedover the course of less than 27 days, whereas most supernovas brighten and dimover three or four months. "This is the fastest evolving supernova we have everseen," said Dovi Poznanski of the Lawrence Berkeley National Laboratory.Poznanski rediscovered the supernova while searching through old observations. The rapid dimming of the supernova and certain signatures inits spectrum, such as a strong helium signal, suggest that this star explodedby a previously unknown mechanism, first proposed by Lars Bildsten of UC SantaBarbara. The idea involves a binary pair of white dwarfs, one ofwhich is primarily made of helium that is being slowly siphoned off by itscompanion. When enough helium accumulates on the surface of the main whitedwarf, an explosion occurs that powers a faint and brief thermonuclearsupernova. This process is akin to a nova, where matter, mainlyhydrogen, falls onto a star, slowly building up and then exploding, but withless force then a full-fledged supernova. SN2002bj had about 1,000 times moreenergy than a typical nova though. Christopher Stubbs of Harvard University has jokingly dubbedthese ".Ia" supernovas, because they are one-tenth as bright and lastfor one-tenth the time as a Type Ia supernova. The new supernova is described in the Nov. 6 issue of thejournal Science.